Will Your City See Snow on December 25th? December 25th is fast approaching — but will yours be snow-laden? 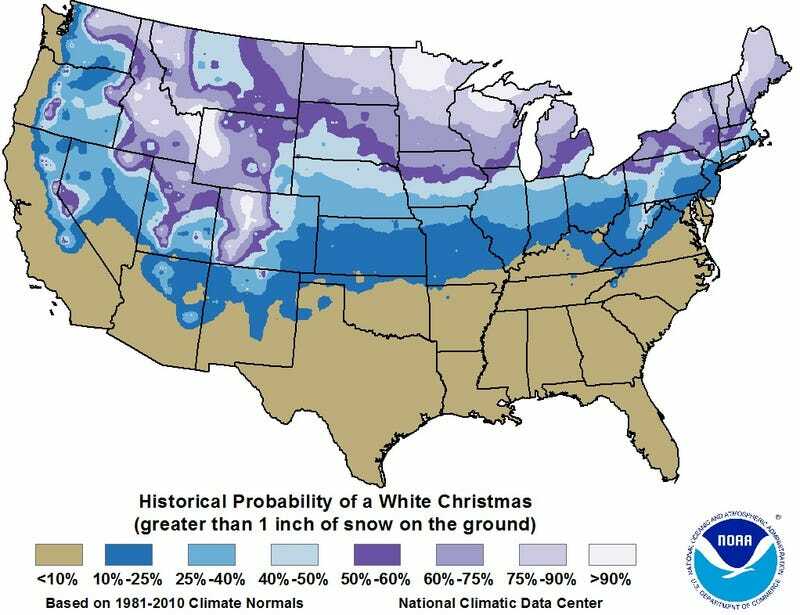 This map, released by NOAA and the National Climatic Data Center (NCDC), gives the probability of a "White Christmas" across the continental United States. Generally, the greatest probabilities lie where they would be expected—over the northern U.S. and in mountainous areas. In defining a 'white Christmas' as having a snow depth of at least 1 inch, the chances are 60% or better over an area including much of the northern Rockies, the northern Great Plains, the Great Lakes area, and most of New England. The chances are less than 20% over most of the southern third of the country excluding the Rockies, along with the Pacific coast. Those interested in keeping track of North American snowfall in the days leading up to December 25th should check out NOAA's Operational Daily Snow Analysis Charts. A version of this post appeared in December, 2012.